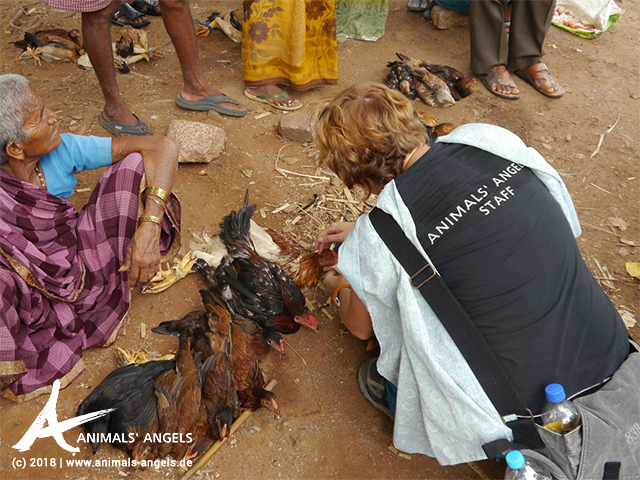 At animal markets in India, the chickens offered for sale have to lie on the ground with their legs tied together. It is hot and dusty. Many ‚pant’ with their beaks wide open. There are tea cups lying around everywhere at the market. We take and wash them and start watering the chickens. At first, they are too stressed to accept the water, but little by little, they all start to drink. We are very pleased that the owners follow our example and start watering their animals themselves. Today, we were able bring the chickens some relief – although we know that this is just a little gesture between all the misery surrounding us at this market.